Andrews McMeel Publishing, 9780740751189, 560pp. More than 150 million Americans were born after the post-World War II years. Almost all of them know, remember, and hold dear to their hearts the numerous memories that stretch From ABBA to Zoom. Take a walk . 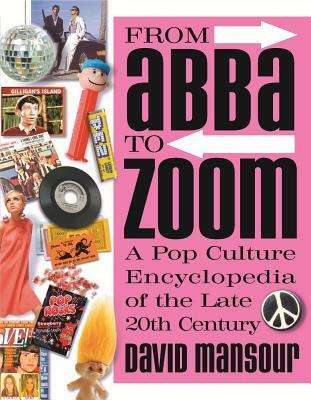 . . down memory lane, you Boomers and Gen Xers From ABBA to Zoom is sure to grab anyone born in the 1950s, '60s, '70s, or '80s. Whether you grew up watching The Huckleberry Hound Show, Johnny Quest, or Sesame Street, this cultural encyclopedia is sure to draw you into a nostalgic and fun-filled read that you just can't put down. American pop culture aficionado David Mansour spent 18 years accumulating an extensive collection of dolls, lunch boxes, board games, TV memorabilia, and other items from the 1960s through the '90s. That fascination, along with his lifelong lists--from "best toys" to "all-time coolest singers"--were the genesis for this wide-ranging volume of Boomer and Generation X treasures. Readers will relish the mere mention of some of their greatest childhood and adolescent connections, then rush to learn the well-researched details behind those icons. Farrah Fawcett's feathered hair, James Bond movies, Lost in Space, Woodstock--it's all here In page after page, more than 3,000 references arranged alphabetically make this a true trip through the Boom Times. Totally groovy. David Mansour is an avid pop-culture collector, particularly of dolls, lunch boxes, board games, action figures, books, records, and all things late 20th century. David, a professional hairstylist, lives in Kansas City, Mo.